I am hoping to start again some time in 2014. If you are interested in taking part, please get in touch and I will contact you as soon as I have some new dates. All ingredients and utensils will be provided, and you will be provided with handouts to take home. 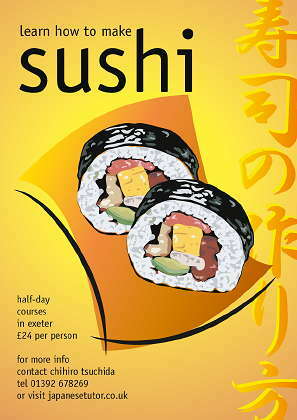 At the end of the class, you will be able to taste what you have made, together with free miso soup and green tea. We won’t be using raw fish in this class. Instead we will be using smoked salmon and rollmop herrings as toppings for the nigiri zushi. Fillings for the sushi rolls will include avocado, tuna mayonnaise,cheese and cucumber, etc. Please bring a tea towel and some sort of container (e.g. tupperware) to put your sushi in when you take it home. The classes cost £24 per student. Please note that advance payment is required, and that a 50% cancellation fee applies. If paying by cheque (payable to “Chihiro Tsuchida”; see contact page for address), please make your payment at least one week in advance.